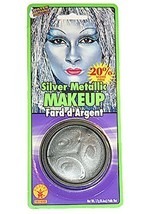 Add this green base makeup to your costume for a complete Wicked Witch, Incredible Hulk or alien look. The cream makeup is non toxic and washes off easily. Customize your look with this and all of our makeup kits!